In addition to carbon dioxide’s heat-trapping effect, the increase in its concentration in the atmosphere has another important effect on the oceans and everything that lives in them and depends upon them. As the oceans absorb carbon dioxide from the air, the chemistry of the water is altered, gradually acidifying the oceans. Ocean waters are now 30 percent more acidic than they were before human activities began adding excess carbon dioxide to the atmosphere. As this acidification continues, less calcium becomes available to living things in the ocean that form shells or skeletons from calcium carbonate. This poses a threat to shellfish, corals, and plankton species that form the base of important marine food chains. The full implications of such extreme changes in ocean ecosystems are not yet clear, but there is now evidence from some ocean basins, such as the Pacific Ocean along the Northwest coast of United States, that the effects of acidification are already apparent. 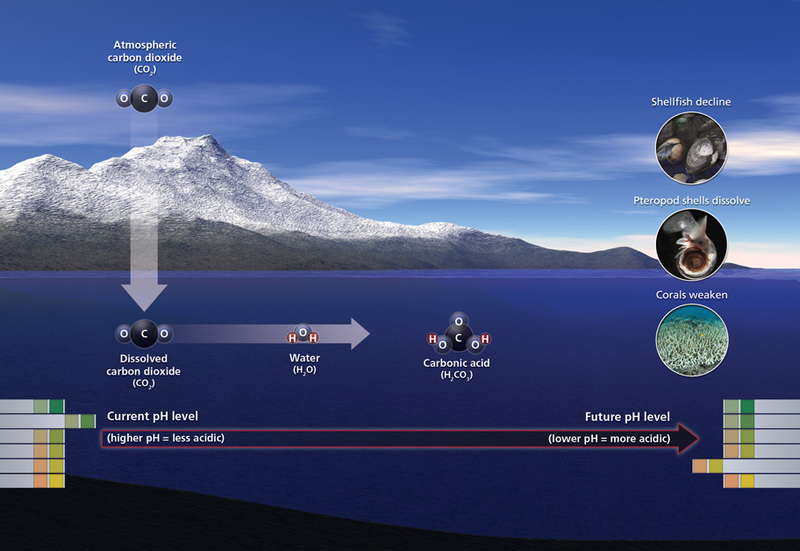 The maps show projections of acidification (pH change) under two scenarios of atmospheric CO2 concentration.